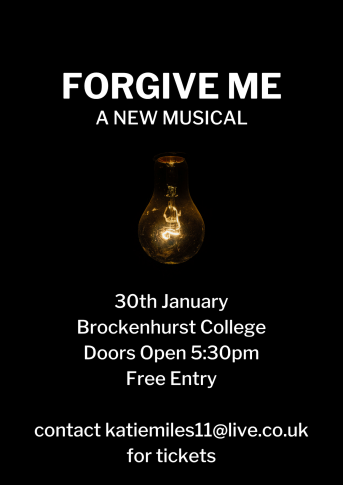 Join us on Wednesday 30th January for the debut performance of ‘Forgive Me’ – a new musical written by our Performing Arts student, Katie-Ann Miles. The musical explores male mental health and the impact that females can have on it. After Nathan commits suicide, his wife (Alison) and ex-girlfriend (Rachel) grapple with his death. They soon realise how many things in Nathan’s life they didn’t know about. Entry is free and there will be a collection for the charity ‘Mind’ after the performance. Estimated running time 45-60 minutes. Please contact katiemiles11@live.co.uk for tickets or more info.